It’s been 3 weeks since I’ve been with Elise 24/7. Being cooped up at home all day is mind-numbing. The purpose of being at home is to spend more time with her but it’s important to make sure that she gets to learn or experience something new each week. I’ve heard about Busy Tables from the October moms, who’ve brought their little ones there a few times before. I finally brought her there this week! Located at Rochester Mall, it’s a 5 minute brisk walk or a 10 minute stroll from Buona Vista MRT. The layout of the mall makes it challenging for a directionally-challenged person like me so just take the lift up to the 3rd floor and you’ll find your way soon enough. 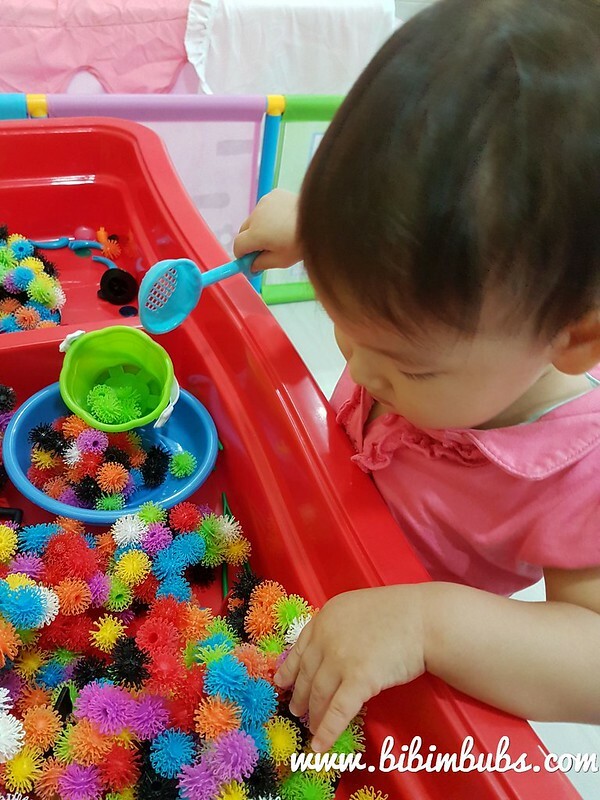 After Elise passed a simple temperature check, she was free to explore the place! 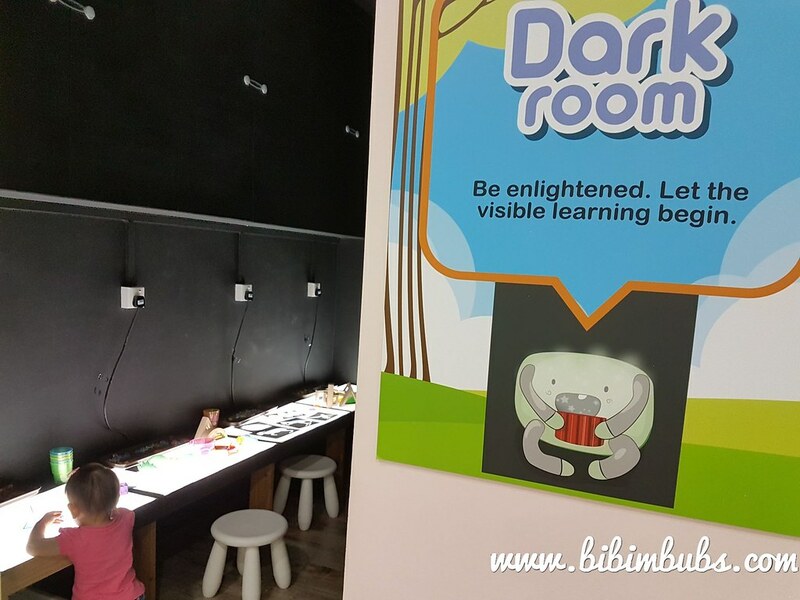 Brightly lit and spacious, it’s a safe place for little children from 0 to 6 years old to roam around safely. 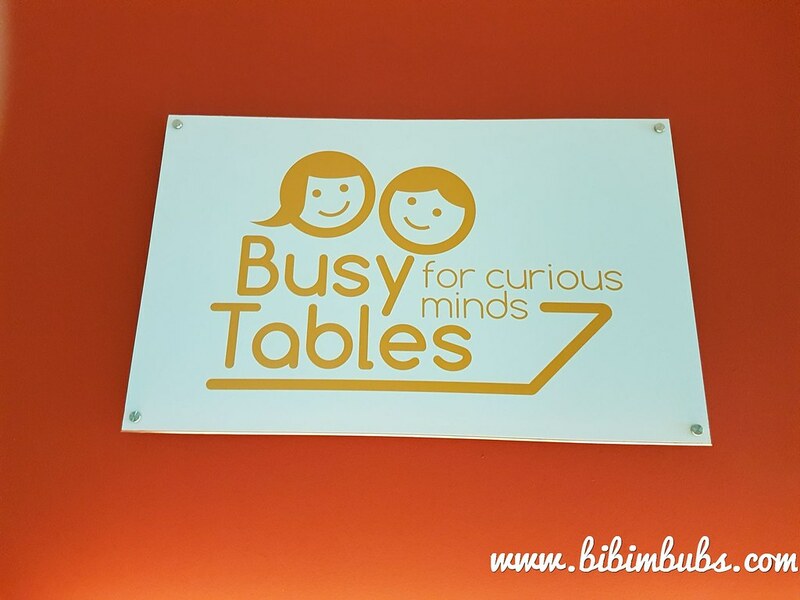 Jeff, the owner of Busy Tables, told us that children of Elise’s age prefer to crawl around rather than sit down for activities due to their limited attention span. 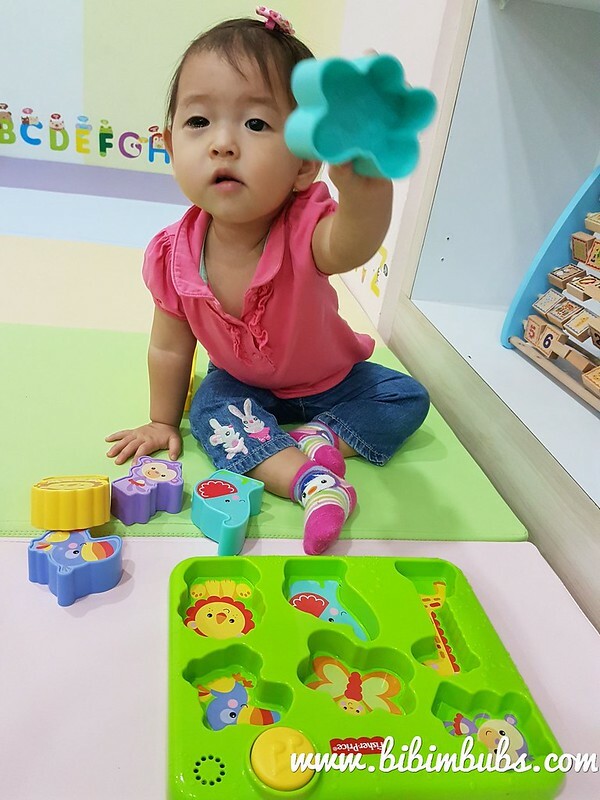 It’s a pity because otherwise, she could try out Busy Cards, a set of mission cards with increasing levels and tiers for children to complete while utilising the resources there. 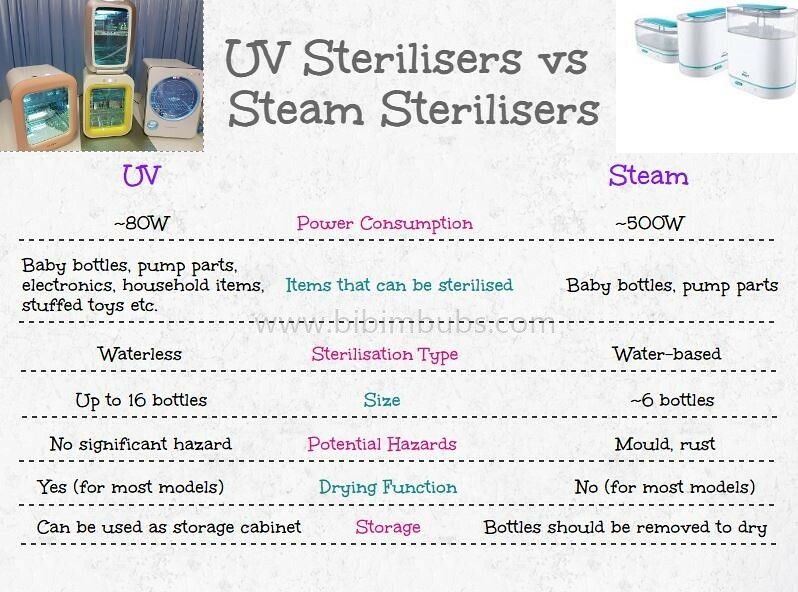 If you have an older child, you can try it out with them! 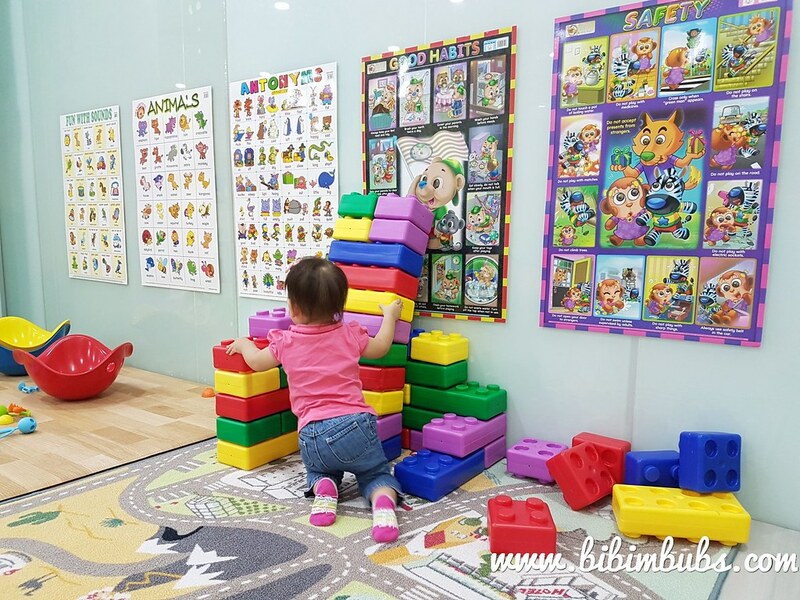 Elise headed straight for the lightweight gigantic Lego-like plastic building blocks. 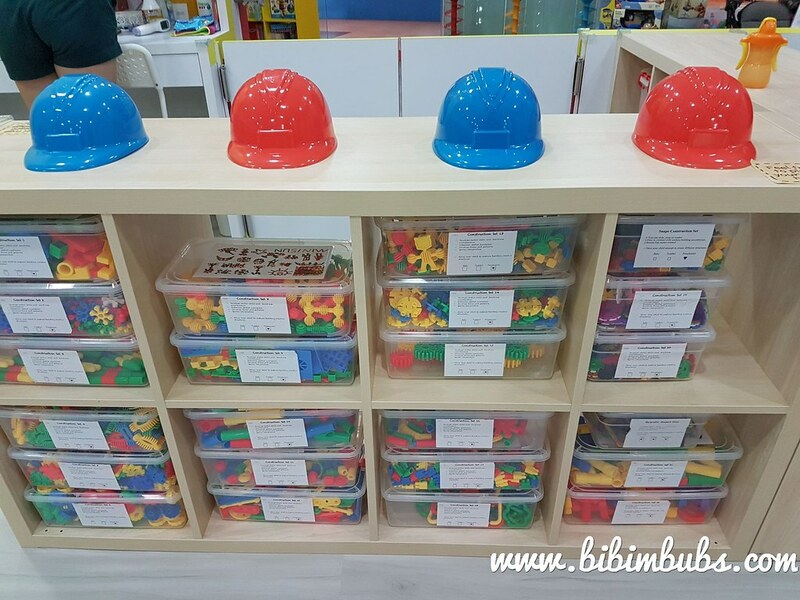 It was part of the Construction Corner where there were little helmets for and building toys neatly separated into boxes for individual play. 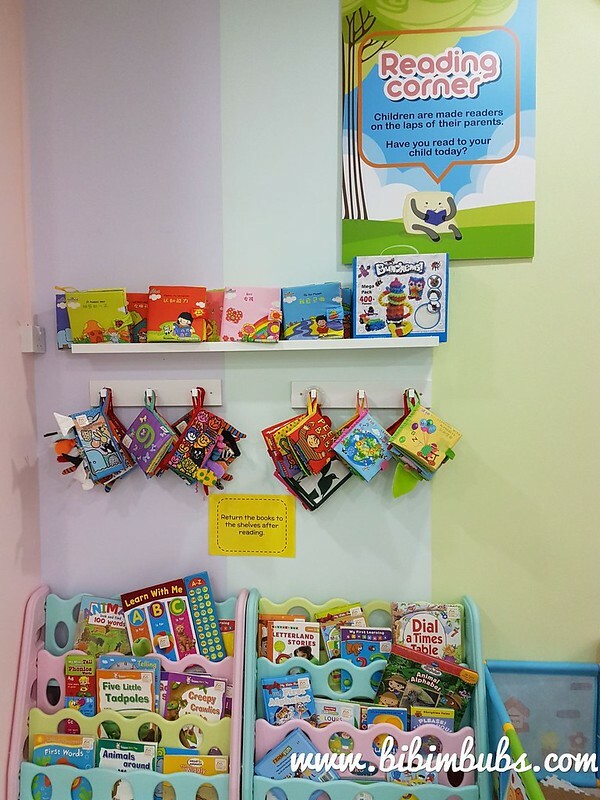 The Reading Corner is well stocked with books for older children in the shelves for easy reach and interactive cloth books on top for the younger babies. There’re books from the Jellycat Soft Tails series, bilingual books and sound books. 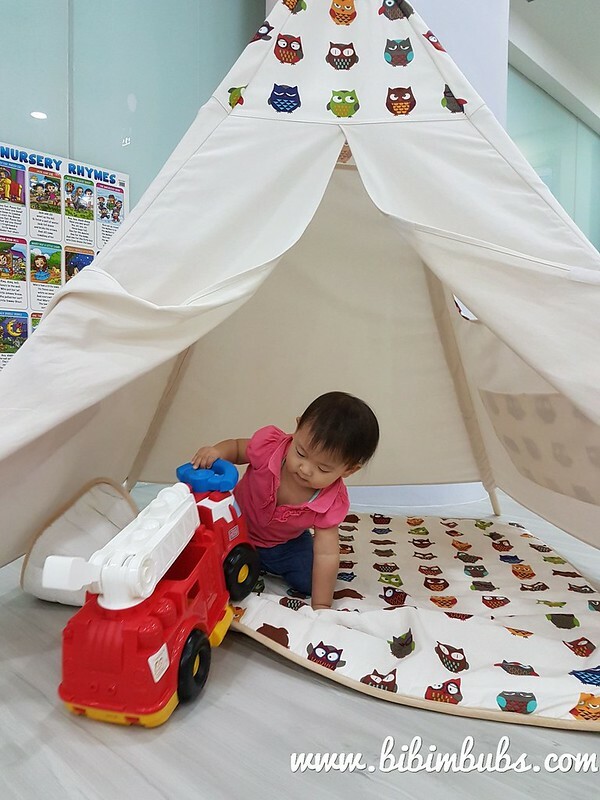 The Tots Area had a house tent with two cushy armchairs for tots to relax. The playmats at this area were thicker to cushion falls for the toddlers. Along the wall, the shelves held toys suitable for babies 0 to 2. Surprisingly, the toys are still in great condition, which meant that previous users have been using them with care. There were toys from Fisher Price, V Tech and Leapfrog among other brands. Beside the tent at the Sensory Area was a sand table filled with Bunchems. Apparently, the theme changes every few weeks. Elise spent a fair bit of time at this station, touching, prodding and scooping the balls into the bucket. This activity requires 100% adult supervision because I saw her munching on something and pried open her mouth to find a black Bunchem inside her mouth. -_- It also gets trapped in your hair, so please watch your kids at this station. I was impressed by the thought and effort put into creating the Learning Resource Library. 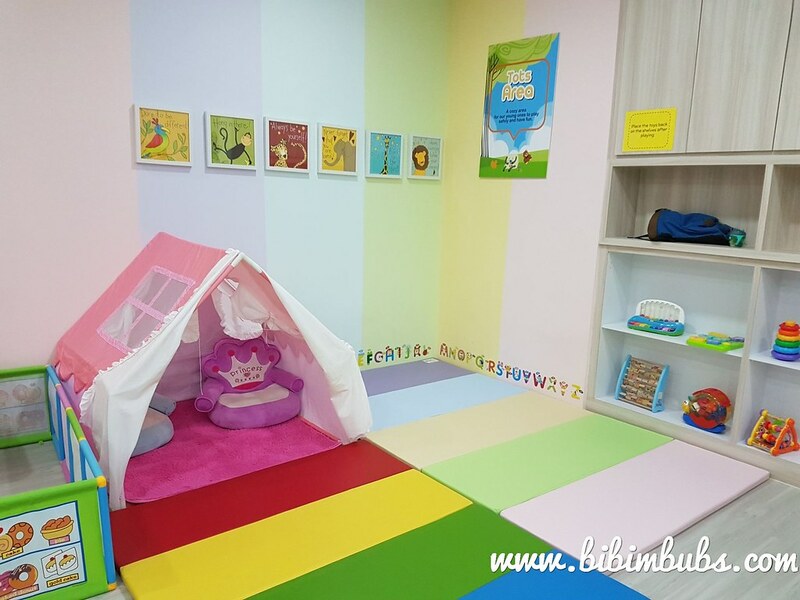 The library itself is divided into Lettering, Numeracy, Motor Skills and Problem Solving and arranged in terms of difficulty for children from ages 0 to 6! How thoughtful is that?! 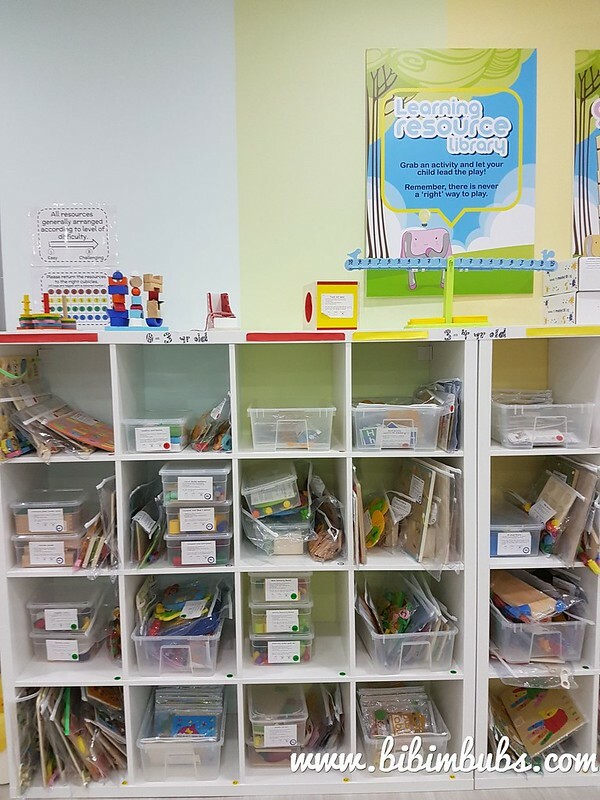 In each cubby hole are transclucent folders or boxes containing individual activities and ALL of them are neatly labelled! 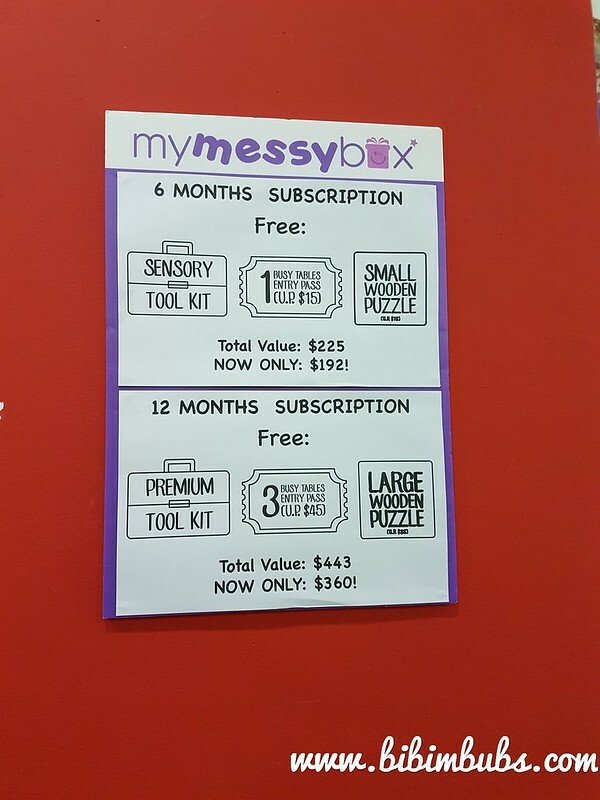 I picked out a box from Motor Skills for kids aged 0 to 2. This set was a Vegetable Cutting Set where the parts were joined by magnets which had to be “cut” using a wooden knife. Elise decided to just pull them apart by brute force instead. 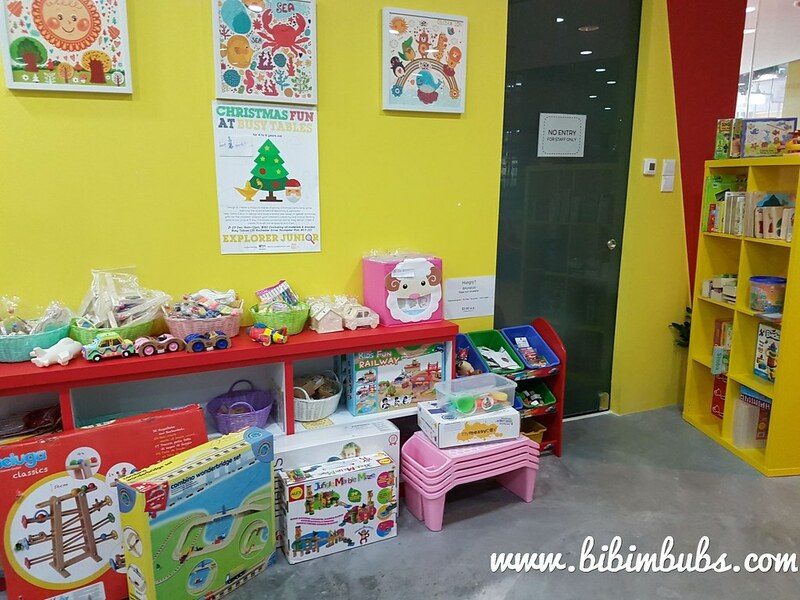 Near the entrance are toys and activities which you can purchase home for your child. They have unpainted wooden toys which you can doodle on too. 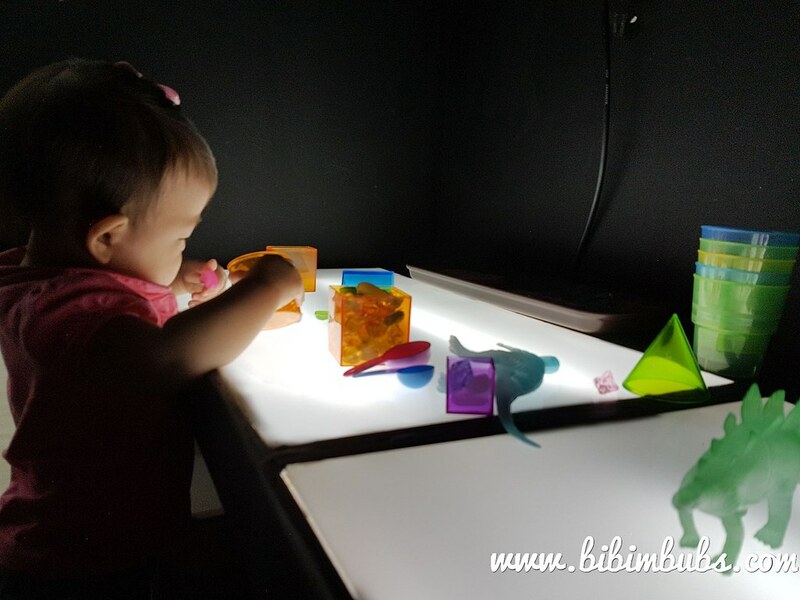 In summary, I would say that it is a place where a lot of thought is put into encouraging learning through play for children and is worth at least a visit there. I saw this banner near the entrance. 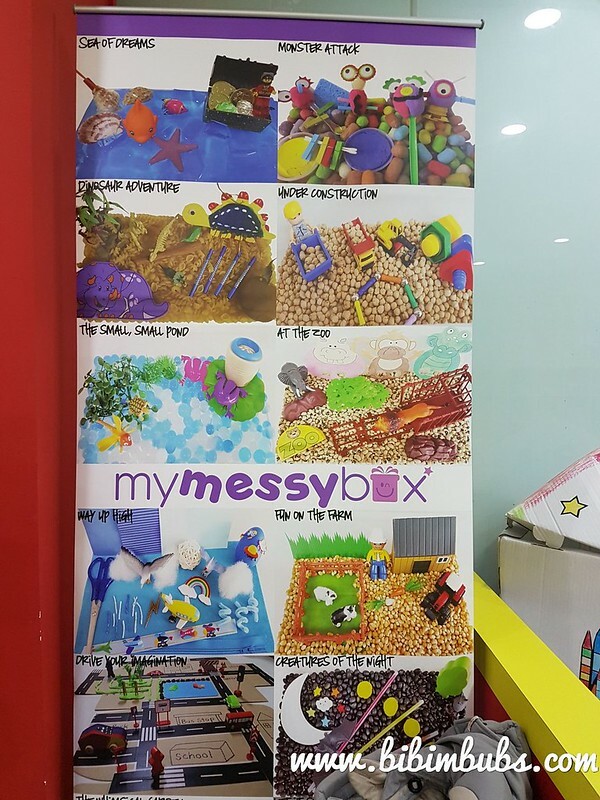 My Messy Box is a monthly subscription box which encourages messy play. 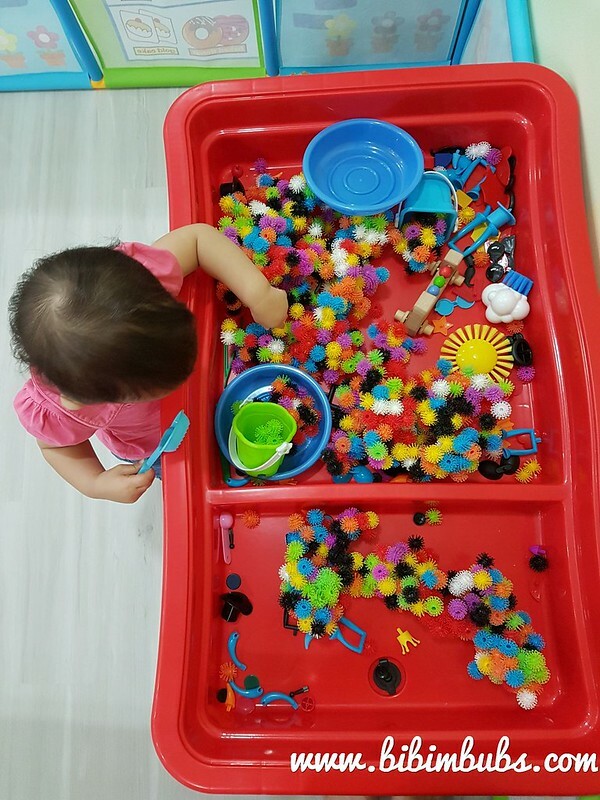 Messy play allows children to develop their senses as they touch different textures and forms. Busy Tables has very kindly sponsored 5 passes to interested readers! To take part in this giveaway, follow the steps below! 4. 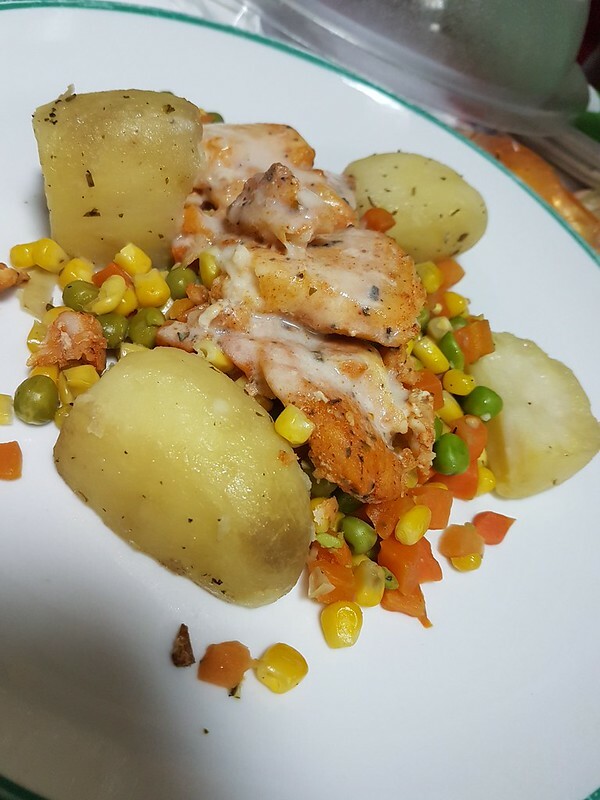 Tag 3 mummy friends and leave a comment on the post telling me which corner appeals to you the most! ** No monetary compensation was received for this review.